While the fortune teller entertains him, he is robbed from behind. 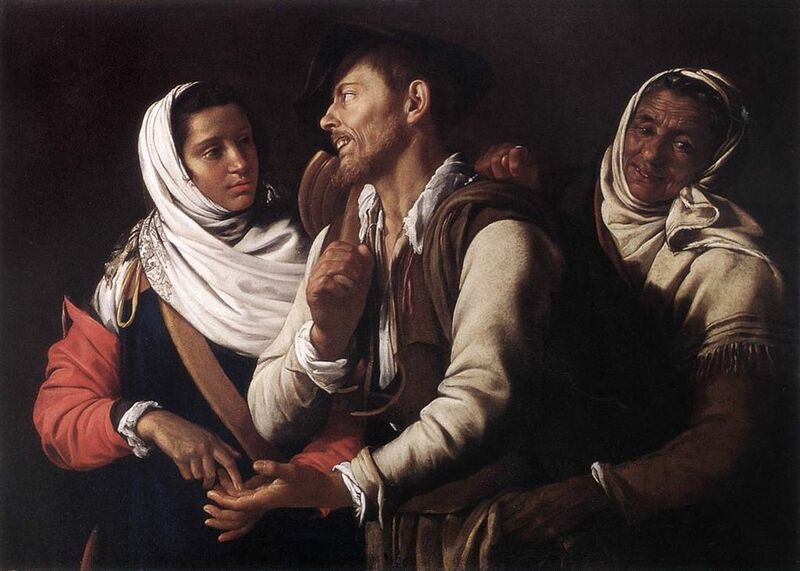 “The Fortune Teller” by Simon Vouet (1590-1649). When someone claims the ability to predict the future, they claim the ability to do the impossible. Then we have no choice except to suspect their honesty. Therefore, when someone offers to “read” your palm, shuffles a deck of Tarot cards, or puts a crystal ball on the table, we should protect our wallet and back off. Yet fortune tellers always entice some people. Frightened by the unknowable, we all want to believe, and some do. These stay to listen, and the rest of us are apt to smugly call them gullible. Yet there is a different type of fortune teller who has almost no trouble getting everyone to listen. Instead of predicting the future, these fortune tellers grandly proclaim as peerless the intelligence of hindsight. These speak with the perfect knowledge of the critic. In hindsight, was invading Iraq and toppling the regime of Saddam Hussein a mistake? Here is probably the most famous answer to such blabbering critics. When as a nation, we decided to invade Iraq and end an evil tyrant’s bloodthirsty rule, we did so for many reasons, but we could not do so with perfect knowledge. Until the future becomes the past, except for what our Lord has blessed us to know, we must pray, guess, and hope for the best. Accurate or not, President George W. Bush correctly used the intelligence given him, and our military forces succeeded in pacifying Iraq. Then the critics took over, and with increasing rapidity the Middle East is descending into chaos. Yet instead of trying to correct President Barack H. Obama’s obvious foolishness, the corporate-owned news media wants to grill Republican presidential candidates as if it were possible to know in the past what we know now. When we know that such perfection is impossible, questions solely based upon knowledge gained in hindsight do nothing but stupidly insult people who have dedicated their lives to serving us. If you are one who wants to properly contemplate what it means to be a doer of deeds, please consider reading A Memorial Day Devotion for Christians. WHY IS EVERYONE EXCEPT THE ILLEGAL IMMIGRANTS RESPONSIBLE FOR TEARING APART THIS FAMILY?